Papers: Correspondence in Charles Evans Hughes papers, 1914-1930; and Nicholas Murray Butler papers, [ca. 1891-1947]. Papers: Correspondence in American Association for Labor Legislation correspondence, 1920-1925. Papers: Correspondence in Civil Service Reform Association records, 1880-1947; and Jacob Gould Schurman papers, 1878-1986. Papers: Correspondence in John Wingate Weeks papers, 1877-1926. Papers: Correspondence in Benjamin Strong papers, 1911-1929 (bulk 1914-1928). Papers: Correspondence in Joseph Hampton Moore papers, 1884-1949. Papers: 203 microfilm reels of selected portions of originals (1914-1963) in Ohio Historical Society. Papers: In Hubert Work miscellaneous papers, 1922-1939; Ray Lyman Wilbur papers, 1906-1964; E. Carl Wallen papers, 1918-1923; and Joseph Jessey photographs, 1923. Papers: Correspondence in Richard Lieber papers, 1892-1958 (bulk 1933-1944); and Will Harrison Hays papers, 1857-1954 (bulk 1914-1954). Papers: 1 letter (May 24, 1916) in Sang autograph collection, 1751-1954; and 1 letter (April 2, 1921) and enrollment card (April 6, 1921) in The Order of Bookfellows in Bookfellow Foundation autograph collection, 1793-1945. Papers: 1908-1926. 3 containers. Finding aid. Additional Papers: Correspondence in Stanley Washburn papers, 1912-1945; Mabel Walker Willebrandt papers 1881-1978, relating to husbands service as assistant attorney general under Harding; and 263 reels of microfilm of originals (1888-1923) at the Ohio Historical Society. Papers: Miscellaneous references and letters (1904-1923) in various collections. Finding aid. Papers: Correspondence in McDowell family papers, 1792-1966. Papers: Ca. 240 items (ca. 1916-1920) in various collections; and in A.F.R. Lawrence collection of historical spoken word sound recordings, 1900-1970. Papers: 1888-1923. 250 feet. 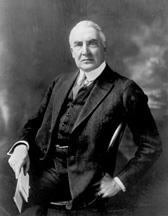 Business, personal and political papers from throughout Hardings career including correspondence, speeches and appointment books, clippings, photographs, and campaign records. Available on 263 microfilm reels. Finding aid. Additional Papers: Several miscellaneous letters in various collections including Charles E. Hard papers, 1894-1941; Cyril Clemens papers, 1927-1952; Harry Micajah Daugherty papers, 1912-1934; and typescript of The Rise of Warren Gamaliel Harding, 1865-1920 (1970) by Randolph Chandler Downes. Papers: 38 letters to Harding and 132 items of correspondence with George B. Christian, Hardings secretary, in Orlando S. Rapp papers, 1917-1928. Finding aid. Papers: Ca.70 items (1904-1922) in the Andre de Coppet collection. Papers: In Anna Churchill Moulton Tillinghast papers, 1911-1945; Edith Nourse Rogers papers, 1854-1961; Elizabeth Lowell Putnam papers, 1887-1935; and Mary Anderson papers, 1918-1960, available on microfilm. Papers: In Elmer E. Robinson collection, 1765-1950; Harwood family papers, 1722-1962; and Francis B. Loomis papers, 1897-1939, available on microfilm. Papers: Correspondence in Byron Price papers, 1901-1976. Papers: Items in several collections, photographs, and ephemera. Oral History: Discussed in Ralph Palmer Merritt interview. Papers: 1910-1922. 7 letters. Also in Henry Cantwell Wallace papers, 1904-1930. Papers: 1864-1962 (bulk 1920-1923). 12 feet. Photocopies and transcripts of originals in Ohio Historical Society, other repositories, and in private hands collected by Dean Albertson for a biography of Harding. Includes correspondence; speeches; appointment books; congressional hearing transcripts on Veterans Bureau, naval oil reserve leases (Teapot Dome scandal), and Attorney General Harry M. Daugherty; diary (1922) of Ike Hoover; photographs; and calendar of Hardings activities. Finding aid. Access to correspondence of Nan Britten and Carrie Phillips is restricted until 2014. Papers: Correspondence in Arthur Hendrick Vandenberg papers, 1884-1974; Chase Salmon Osborn papers, 1889-1949; James Kerr Pollock papers, 1920-1968; James Orin Murfin papers, 1896-1940; Earl C. Michener papers, 1898-1934 and 1940-1954; Henry Bourne Joy papers, 1883-1937; W.B. Hinsdale papers, 1895-1934; Roy Dikeman Chapin papers, 1886-1937; Benjamin Sawtell Hanchett papers, 1888-1958; and Marion LeRoy Burton papers, 1901-1925. Papers: Correspondence in Thomas Walker Page papers, 1906-1937. Papers: 263 microfilm reels of originals (1883-1965) at Ohio Historical Society. Finding aid. Additional Papers: In William Kent family papers, 1768-1961; Harry Weinberger papers, 1915-1942; Charles Dewey Hilles papers, 1885-1955; Henry Lewis Stimson papers, 1846-1966; Chauncey Mitchell Depew papers, 1880-1928; and Alfred White Van Sinderen collection, 1782-1969. Research Libraries Information Network In addition to the institutions listed above, items are also cataloged in collections at: Alabama Department of Archives and History, Montgomery, AL; Alice T. Miner Colonial Collection, Chazy, NY; Boise State University Library, Boise, ID; Brown University, Providence, RI; Cornell University Libraries, Rare Books and Manuscript Collections, Ithaca, NY; Dartmouth College, Hanover, NH; Hagley Museum and Library, Greenville, DE; Hamilton and Kirkland College, Clinton, NY; Haverford College Library, Haverford, PA; Johns Hopkins University, Milton S. Eisenhower Library, Baltimore, MD; Rosenbach Museum and Library, Philadelphia, PA; Rye Historical Society, Rye, NY; Syracuse University, George Arents Research Library, Syracuse, NY; Temple University Libraries, Philadelphia, PA; University of Minnesota, Immigration History Research Center, St. Paul, MN; University of Nevada, Reno, NV; and Yale Divinity School Library, New Haven, CT.